Join us at the Windhoek Palm Hotel VIP Bar in Windhoek West, located on the corner of Beethoven and Simpson Street. 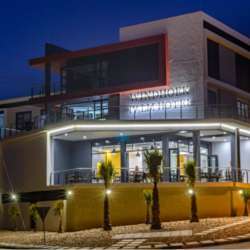 This bar boasts the best view in Windhoek at night, and is nestled in a very quiet and relaxed neighborhood. Join us at this stylish venue for some drinks or snacks and get to know new people from all over the world! There is no entrance fee, each person pays for their own drinks!